Today marks the beginning of my 5th decade on this earth and I thought what better way to celebrate than to recall fond memories and traditions of the past 50 Christmases in this blog entry. When I was growing up, Christmas was always celebrated on Christmas Day. As much as my brother and I would beg my father to let us open “just one gift” on Christmas Eve, the answer was always no. While we feigned disappointment, I think the prolonged suspense helped make Christmas morning all that more special. My fondest Christmas memory of this time in my life was the year I turned 16. I had looked forward to my 16th birthday since I was 8 — no joke. And while the Sweet Sixteen birthday was not all that I hoped it would be, that Christmas more than made up for it. I had decided that I wanted an old-fashioned Christmas that year and my family was kind enough to indulge my wish. We went to a Christmas Tree farm and cut our own tree (typically we decorate with artificial trees), and my grandmother hand-crocheted several ornaments to help decorate it. That evening we went to the midnight Christmas Eve service and when we exited the church it was snowing!! It was going to be a White Christmas – a real dream come true. I will never forget the first Christmas that I spent with my husband’s family. We were not yet engaged, but I was treated as a part of the family from almost the beginning. His family is 100% Italian — something that I have always highly valued as my ancestry is a mish-mash of ethnicities. His grandmother always prepared her celebration on Christmas Eve and she would spend hours in the kitchen preparing the Vigil. Being devout Catholics (at least at some point in their lives), the vigil included only pasta and fish — no meat. While this was an unusual feast, I cherished the tradition and have incorporated it as a part of our family Christmas celebration ever since. required 3 to 4 days, frequently replacing the old water with fresh. About 5 years ago we decided to forego the bacala fritters and replace them with fresh boiled shrimp and crab legs. This is a true delicacy for the family, and a dish that all look forward to eating. I also make Spinach Bread from Cora’s old recipe collection that is simple, yet festive. 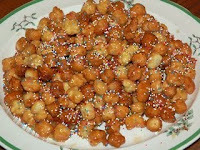 Dessert includes not only holiday cookies, but an Italian specialty called Strufoli — or honey balls. They are not difficult to make, but very time consuming. My husband absolutely loves them however, and I don’t think he would consider it Christmas without them. So, as a labor of love, I make them every year just for him. Over the years it has gradually become tradition for my kids to sleep together in the basement on Christmas Eve. They ARE allowed to open one gift on this night before Christmas — typically the one that includes a new pair of Christmas PJs and a new DVD to watch during the night. They are “banished” to the basement around 10:00 so that Geoff and I can wrap all the stocking gifts while we watch A Preacher’s Wife, It’s a Wonderful Life, and/or A Christmas Story. We usually finish around 12:30 or 1:00 — set out Santa — and go to bed. While I expected this latter tradition to slowly fade as the children got older, I must admit that I was pleasantly surprised two years ago when my eldest daughter, who is now married, planned the overnight stay — her husband included — because she did not want to miss the silly sibling early morning antics, nor did she want to miss the opening of Santa. At our house, Santa leaves a stocking for everyone: grandma — dogs —- parents — and kids of all ages. Apparently this is something that Megan has enjoyed and she has vowed to keep the tradition going long after Geoff and I have faded away. Who would have known that such a simple routine would have developed into such a symbolic tradition over time. Another whimsical idea that has evolved into a Totoro tradition is the making of gingerbread houses. What began as a fun activity to distract the children from the endless wait to Christmas, has gradually become a ministry activity to meet people who are new to our lives, and now to grow closer to families who have become a significant part of our lives. Every year since 1991, I have made a minimum of one gingerbread house per child, with the maximum number of houses being 12 when my daughter invited several friends from school to take part in our annual tradition. The house just doesn’t smell like Christmas until I bake the gingerbread, and we would not recognize the season if the table weren’t covered with symmetrical stacks of gingerbread pieces ready for assembly. Each child (well now, each grown up who is a child at heart) receives a cardboard base, 6 pieces of gingerbread, and a pastry bag filled with royal icing. Newcomers are given a quick lesson on proper pastry bag etiquette, and then everyone quickly assembles their house. The dining table is laden with the necessary candies, cereal, and metallic dragees to decorate an entire gingerbread village. The festivities usually last about 2 hours, and the culinary creations are always unique. 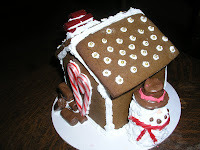 Our tradition is to leave the Gingerbread House up for the holidays, and then eat it on New Year’s Day. So on this special day — 10 days before Christmas and the advent of a new decade of my life — I look back in awesome wonder at all the warm holidays of the past, while I look forward to many more familial gatherings in the future. I thank you for stopping by and sharing in this celebration with me. Happy birthday, Molly! It sounds like you're in for a wonderful holiday season. A very happy birthday to you, kiddo! Reading about your traditions was so enjoyable. Thanks for sharing. Have a wonderful holiday season. Happy Birthday Molly; what a coincidence– we have the same birthday. Have a great day. Happy Birthday and Happy Holidays. What a wonderful read on the Virtual Advent Tour. Thanks! Happy birthday! Your holiday traditions sound wonderful. I got hungry just reading about all the tasty Italian food! Happy Birthday. I loved reading about your traditions. One question: do you have ricotta pie? I just went to a very Italian Thanksgiving where they had it and it was amazing. 'Each child (well now, each grown up who is a child at heart)' – that sums up my own family perfectly. Happy Birthday – and thanks for sharing the wonderful, wonderful Christmas memories. The Christmas Eve seafood recipes sound delish. We always have Christmas Eve at my aunt & uncle's, and her seafood bisque is the absolute high point of the year for me! What a great collection of Christmas memories. Thank you for sharing them! Well, hey! Happy Birthday! Thanks for sharing all your wonderful Christmas memories and traditions, too. It is so wonderful that your oldest daughter planned an overnight stay on Christmas Eve – she and all your children must have such beautiful memories of past Christmases. I think these kinds of memories are so precious and wonderful. I so enjoyed this post Molly and many Happy Birthday wishes from me to you!! (My birthday is this Friday, the 18th!). I got a chuckle over your oldest daughter wanting to continue something that to her was a tradition. We too have several traditions that evolved out of necessity over the years, and to our kids they are tradition! Such a joy to a Mother's heart, isn't it? Have a fantastic birthday night! Happy Birthday Molly!! I loved reading this post. My grandparents were Italian immigrants and we always had the seven fish dinner on Christmas Eve while I was growing up. We've scaled it back now (nobody really liked the bacala and calamari anyway), but still have seafood every Christmas Eve. Happy birthday–I love your stocking tradition and everybody sleeping in the basement. How fun. Happy Birthday, Molly! Thank you so much for sharing your traditions. I'm glad you have been able to balance old traditions with your own. That is lovely (and I love your daughter coming home just so she can sleep in the basement!). My fifth decade began back in June, so we're six months apart! I can say so far, so good! I loved reading about your traditions. The sleeping in the basement sounds like a wonderful one. Happy birthday and I hope you have a wonderful Christmas! I'm three years into this fifth decade and I must say, it is my favorite. Drama days are over. Peace has come to my life. P.S. I love your gingerbread house tradition. That sounds like a delicious meal 🙂 I love how holidays revolve around food. This was a very enjoyable and meaningful post. Your Christmas traditions sound so beautiful plus fun. I'd love to see more pictures of those gingerbread houses. I've never heard of bacala but it sounds delicious. Happy belated birthday, Molly! I hope you had a wonderful day. Thank you for sharing your Christmas memories with us! Have a Merry Christmas this year, Molly. Molly, this is a beautiful post. I love the Christmas Eve tradition of all the kids sleeping together in the basement – I might steal that one! Also, a late but very Happy Birthday to you! Oh Molly, I'm sorry I'm late with my birthday wishes! Happy late birthday to you, dear book-blogging friend, and I really hope you had a wonderful day. I love your post, it is such a thoughtful and loving memory about your stocking tradition. I really like that your married daughter wants to come home with her husband to continue it with him there!!! we have stockings too, and my daughter lifts it every day in the hope that Santa came early, lol!! May your next 50 years be blessed also, Molly. Happy Holidays!